Looking for the best violin and best piano lessons at the finest music school in the South Florida region? You’ve come to the right place. The Academy’s superior training for children of all ages has made it the place to go for the best violin lessons and best piano lessons with the best violin classes and best piano classes that South Florida has to offer, whether you live in Weston, Miramar, Plantation, Pembroke Pines, or anywhere in the South Florida area. Centrally located in Davie/Ft Lauderdale serving the South Florida region including Davie, Weston, Miramar, Cooper City, Sunshine Ranches, Pembroke Pines, Ft Lauderdale, Plantation, Dania, Hollywood, Sunrise, Oakland Park, Hallandale, Wilton Manors, Lauderhill, Lauderdale Lakes, and Coral Springs, in Broward County, and in Dade & Palm Beach Counties. The recognized regional center for classical music study is known for the outstanding formal training it provides with violin lessons and piano lessons for beginners and young musicians of all ages and at all levels. The music school has produced accomplished musicians who have gone on to win scholarships at some of the world’s finest and most prestigious colleges, universities, and music conservatories. A number of Academy violin and piano students have given solo recitals and concert performances at Lincoln Center, Carnegie Hall, and other great concert halls and have won acclaim as prize-winners of both national and international competitions. Our training has proven to be remarkably effective for developing talent, discipline, and the self-confidence that comes with musical accomplishment. The music school’s approach to formal instruction is designed to serve the whole child and maximize the benefits that children can receive from the formal study of classical music. The Academy’s unique kid-friendly class / lesson format enables children of all ages and from as young as 2-yrs-old to begin formal training. Violin and piano masterclass techniques traditionally reserved for students at the most advanced levels are applied to violin and piano lessons for children’s training, from beginners intermediate level students, as well as for very advanced students in the program. In-house concerts and performances at South Florida libraries, schools, and for South Florida cultural, civic, and community organizations, enable Academy students from the very beginning stages of study to the most advanced levels to experience the joys of making music and performing. Some of the most important things you’ll want to know when you’re making decisions about violin study and before buying a violin or choosing a violin teacher can be found here. For information about authentic Suzuki Method training for children, who range from beginners to the most advanced levels, and to learn how Suzuki Method compares with standard traditional training, read the original article, “Suzuki Violin vs Traditional Violin”. 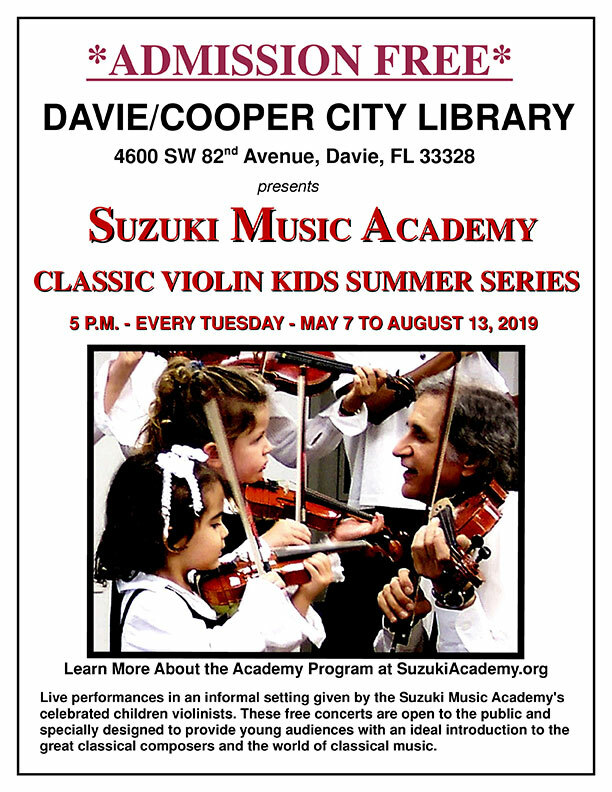 Announcing the Academy’s “Classic Violin Kids Summer Series”, an Academy and Davie/Cooper City Library project that will provide chldren’s classical music programming at 5 p.m. each Tuesday from May 6 through the summer until Tuesday, August 13, the last day of Broward schools summer break. Academy children violinists’ family-freindly classical music presentations provide an ideal introduction to the world of music and the classical violin in an informal settting for kids of all ages and their families. The Tuesday summer classical violin presentations are free and open to the public. We have reserved this summer for our project, “Classic Violin Kids Summer Series” and will resume ‘Violin Kids Play for Kids’ library visits when the 2019-2020 school year starts at the end of the summer. We will post annoucments and details on this page as upcoming Story Time visits are scheduled and confirmed. The Academy’s children violinists and pianists performed music by Beethoven, Dvorak, Bach, and Mozart at this year’s Open-House Concert at the Academy. The childen musicians got an enthusiastic reception from the audience of children and their families who attended the free concert. During the 2018 – 2019 school year, Academy’s children violinists enjoyed enthusiastic receptions by the children and parents attending Broward County and City of Plantation Libraries on their ‘Kids Play for Kids’ visits to Story Time programs and at their appearances at special events. The Suzuki Music Academy’s signature ‘Violin Kids Play for Kids’ presentations for Library ‘Story Time Specials’ are designed to give even the youngest children and their families an ideal kid-friendly introduction to the world of classical music through fun-filled interactive musical songs and games, along with performances by Academy children violinists. Our visit to the Helen B. Hoffman Plantation Children’s Library in February kicked off this year’s ‘Kids Play for Kids’ library Story Time series, We will be posting announcements of other libraries we will be visiting beginning in August for the 2019-2020 school year, including a visit to the Nova Southeastern University Alvin Sherman Library in Davie at Nova Southeastern University, 3100 Ray Ferraro, Jr. Blvd, Davie, FL. here and on our UPCOMING EVENTS and KIDS PLAY FOR KIDS CORNER pages, when times, dates, and other details areconfirmed. CLICK HERE for Directions and map showing our location. Academy children violinists and pianists performed music by Bach, Handel, Brahms, and Beethoven for an enthusiastic crowd that had gathered to hear the special Saturday afternoon concert open to the public at the Academy’s January Open-House Concert. The Suzuki Music Academy’s children violinists received standing ovations at their ‘Children’s Classic Holiday Concert’, a concert for families with children of all ages featuring traditional holiday music, to a standing-room-only audience on Tuesday, December 12, 2017 at the Stirling Road Branch Library in Hollywood, FL 33312. 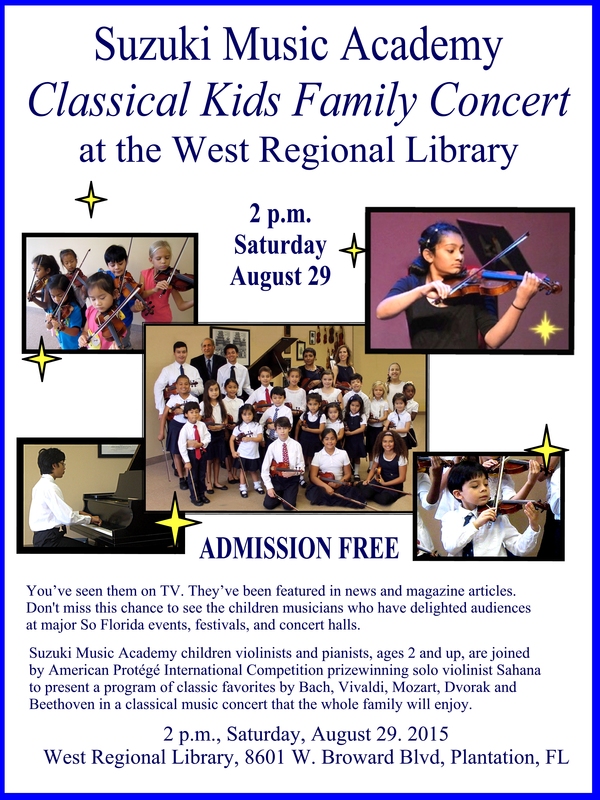 The children violinists, ages 3 and up, also performed classic favorites by Bach, Mozart, Brahms, Handel, and Beethoven for this concert.